In worship of God, we are lifted up to Him by what we say and sing, do and hear (our senses) and also by what we see. 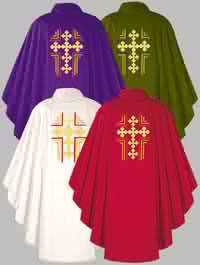 Vestment colours express certain moods or seasons in the life-cycle of the Church. Mass is offered for many purposes and in honour of many classes of saint. These various purposes are designated and symbolized by the colour of the vestments that the Church prescribes for each Mass. The symbol of innocence and triumph, celebration and joy. It is used on all feasts of the joyful and glorious mysteries of our Lord's life (e.g. Christmas and Easter), on the feasts of our Blessed Mother, on the feasts of angels and of all saints who were not martyrs. The colour of blood, is used on all feasts of our Lord's Cross and Passion, on the feasts of the Apostles and of all martyrs. Red is also used on Pentecost and in Masses of the Holy Spirit, in memory of the tongues of fire of the First Pentecost. A symbol of penance, expiation and preparation before a great feast. It is used during the penitential seasons of Advent and Lent, and on fast days and vigils. The most used colour. It is the colour of nature, new life and growth, and it is the symbol of hope. It is used during the two periods of Ordinary Time, which occur after the feast of the Epiphany and after Pentecost Sunday. Green reminds us during the Church's year that we are always being given new life to nourish our spirit, as we listen to God's Word at Mass and receive Holy Communion.